Each trait has its opposite. Which side describes you? I’m definitely right-brained and left handed! I am confused. I am detail oriented and like to do things step by step. I am not sure what is meant by associative but I am a visual person. Auditory instruction puts me to sleep unless I am driving in the car. I like structure. I like to know exactly what is going to happen and when. I like closure. Do not like things hanging. I am not sure if I am sequential or global but my house is still full of stuff that is out in the open and I can’t throw anything away! For littlebirdie, You may be what’s called mixed dominant, which means you can switch back and forth between the two when needed. Your visual tendencies and wanting to hang on to stuff is key. Right-brained people tend to see the possibilities for the future so every item in their possession has potential for future use, making it hard to get rid of. One solution is to evaluate the here and now to see what you really need. Make space in your home for that stuff first. Then look to the past and see what stuff you really want to keep, storing as much of it electronically as possible to save space. Then evaluate your possible future(s). Get rid of all the stuff that you dreamed about in the past but is no longer a likely future for you. I am definitely a right-brained person. I’m left-handed, a musician, a writer and a creative type. 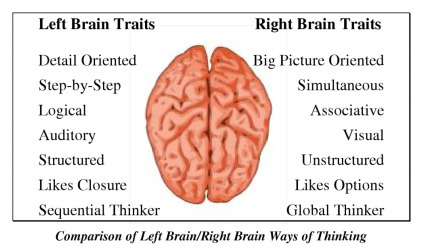 I’m right-brained, according to the chart, in every way. I’m visual, definitely global, spontaneous, etc. But I’ve got one left-brained trait: I’m very detail oriented. I’m a perfectionist about many things, but not all. And I’ve got a tremendous eye for things that are out of place, from crooked pictures to misplaced punctuation marks. I’m a very good editor because I spot details many people miss. I love order, but I’m not great about putting stuff away, so clutter ensues. And to keep certain areas of the house clean, piles form elsewhere, both visibly and behind doors and drawers. Yes! I am both right-brained and right handed. I like to read the directions for anything I buy, so I think that may be the same tendency. I would think that is kind of left, brained, too. That’s funny about sending the article to your husband. I know it has helped mine to think about me and my tendencies in a new way. I try to overcome them for his sake, but they are always there.